Never-dried sulfite wood pulp was beaten and subsequently microfibrillated before being submitted to periodate oxidation for various times. The oxidation progress, which was followed by 13C solid-state NMR spectroscopy in conjunction with degree of oxidation (DO) measurements together with ultrastructural observations, revealed that the cellulose crystallinity and microfibrillar integrity were kept intact until a DO of 0.3/0.4, indicating that at that level, the cellulose microfibrils had been oxidized exclusively at their surface. Beyond this DO value, the sample crystallinity started to deteriorate, as the oxidation progressed toward the core of the microfibrils. Remarkably, throughout the oxidation, the created carbonyl moieties were never observed, as they were readily recombined into hemiacetals by cyclization either within the same anhydro glucose unit (AGU) or with the adjacent un-oxidized AGUs of the same cellulose chain. At DO below 0.3/0.4, hemiacetal coupling with adjacent cellulose chains was also considered, but it appeared unlikely in view of the interchain distance imposed by the crystalline lattice. The oxidized samples were subjected to a reductive amination with benzylamine in order to convert their hydrophilic surfaces into hydrophobic ones. Despite the ease of this derivatization, the analysis of the 13C solid-state NMR spectra of the aminated products showed that, below a DO of 0.3, only half of the hemiacetal moieties could be converted into secondary amine products, whereas the other half remained untouched, likely for steric reasons. 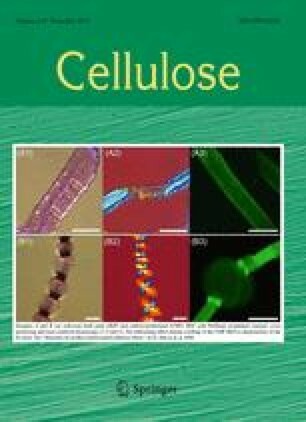 The authors thank H. Chanzy for fruitful discussions during the writing of this work, as well as C. Lancelon-Pin for her assistance in the TEM observation of the cellulose samples.